In all sports there are characters. These individuals range from the comic, the weirdo, the expert (real expertise not required), the coach (real coaching ability not required), the gear geek, friendly person, the gossip, the quiet person, and person that is an inspiration. The variances are as vast as human personality. In archery I have discovered a rich environment of characters equal to if not surpassing the characters from cycling, running and triathlon I have met. From time to time, in this section, I will introduce some of the archery characters I meet. Tim was born and raised in Atlanta, Georgia. 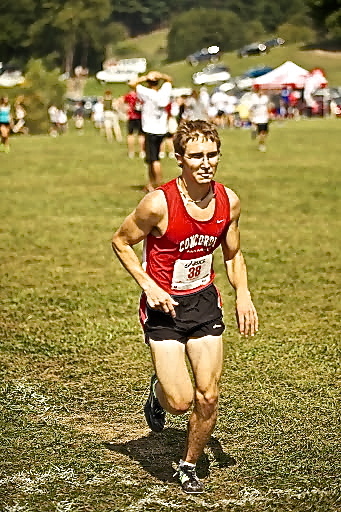 He attended high school at Woodward Academy where he was the Atlanta Junior Champion, Georgia Junior Champion and Westlake National Junior Champion. He attended the University of Georgia in Athenswhere he made All SEC, All American, and College All Star teams. He left college early and turned professional at age 20. He earned his tour card at 21 years, 1 month (Among of the youngest in history). Awhile back I wrote a post that contained a bit about Ironman triathlons. The post was co-authored by two other archers and was fairly well read. One of the readers was Ben Summers, an archer and fellow Ironman. 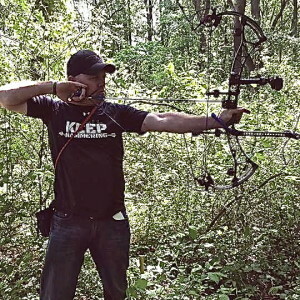 Ben wrote to me the he and two of his friends, both in the archery business at Bow tech and Kinsey’s are racing in Ironman Timberman in Connecticut. He invited me to join them. In fact, I’d always wanted to do that specific event and as yet have not. I considered it and even checked to see if I could still enter – I could. But, the Timberman is very close to the IBO World Championship on the calendar so I decided to stick with archer in August. Being curious about Ben, as I am about other archers that train and compete in sports outside of shooting, in particular triathlons, I gave him a call. I learned that Ben is one of those special characters in archery that do a lot for the sport. Ben has been involved with archery since he was a child. His parents own T.R.U. 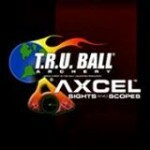 Ball/ Axcel where he’s worked since he was 10 years old. 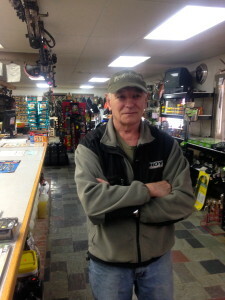 After 22 years of working in the family owned business he is now the Director of Operations. 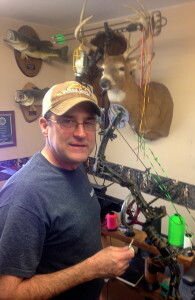 He is also on the Board of Directors of the Archery Trade Association. When talking about his role at the ATA he is proud that though their efforts the ATA has raised millions of dollars that have been donated to archery in school programs and to support USA Archery. Ben has always been an athlete and I could sense his passion to give back to sports. When I write he always been an athlete, he pointed out, “I’m more of the big guy type, built like a football player rather than a whippet-like triathlete.” Actually, he was a football player and weight lifter – which probably bode well for an archer. Training for an Ironman, being on the Board of Directors with the ATA, working as Director of Operations for TruBall/Axcel eats up a lot of time. Still he manages to be a father of four and husband. 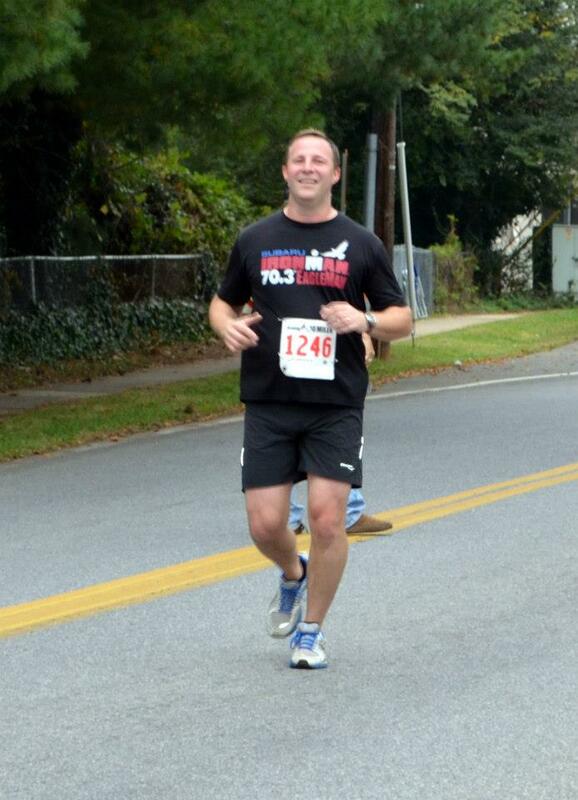 As a dad he’s inspired his 15-year of daughter to become an athlete and runner. It was great talking with Ben about his life and family. It was cool to discover we’ve done the same Ironman events, at times competing in the same race. 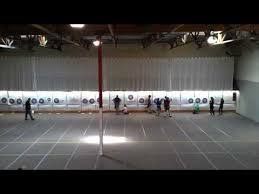 I also find it very interesting to learn how many archers are driven to put it on the line and test themselves in ways beyond shooting. When I think about it, archery and Ironman are mostly mental. Corey Bryant is a Professional archer. I met him in Georgia at the Buckeyes 3D tournament in Social Circle. We were paired to shoot by range official, David Alligood. I was a little nervous being paired with him but his politeness, good manners, and friendly attitude led to a fun and relaxed competition. Corey is from Decatur, Georgia. He has been shooting a bow since he was nine. He says, “By the time I was 11, I was pretty good.” His father, who owned a hunting club, recognized Corey’s talent. He’d pit Corey against adult bow hunters claiming, “My son can out shoot you!” With the challenge delivered, eleven-year-old Corey would find himself shooting against and beating adults. When he was a student in suburban Atlanta, Corey didn’t even know “real” archery competitions existed. “We didn’t have an archery team at Columbia High School,” he recalled. 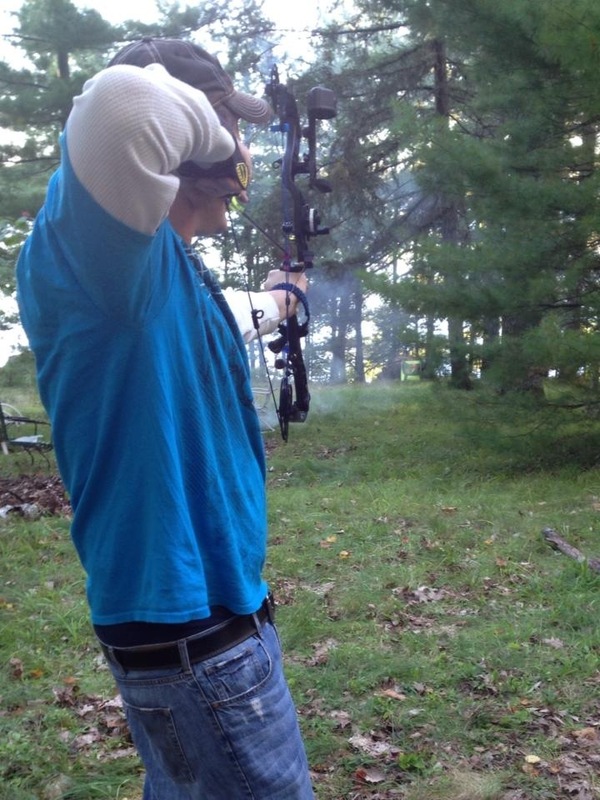 It wasn’t until 2005 that he shot in an archery tournament, a small club 3D shoot. 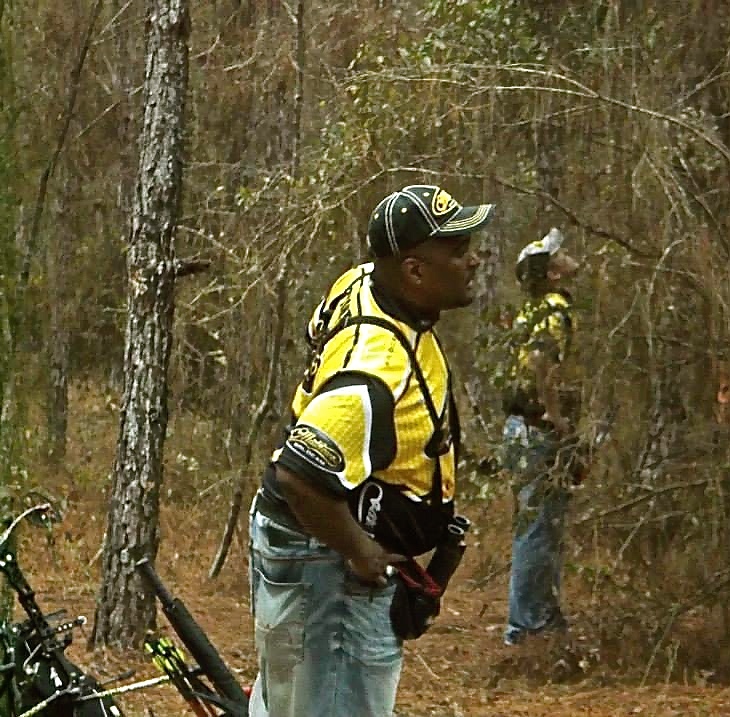 Later, he entered an ASA 3D shoot in the novice class and by 2006 was being chased by the local top pros. One individual pro from Madison, GA told Corey, “You will never beat me.” He was wrong. A year later, Corey was 2nd at the ASA Championship in the novice class and moved to the Open C class. 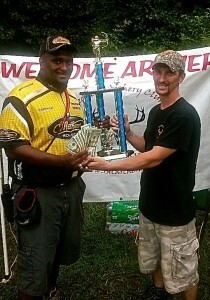 As a semi-pro he earned 2nd at the ASA in Newberry, FL. That was followed by 7th at the ASA Southwest Shoot Out in Paris, TX, 5th at the Mathews Pro-Am, and 11th at the ASA Classic in Colman, AL. In 2014, as a semi-pro, he earned 2nd in the ASA Shooter of the Year awards. 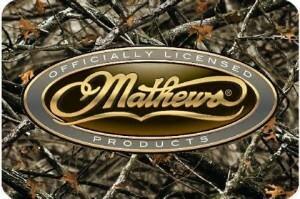 Recently, a friend of his was determined to have Corey become a member of the Mathews Pro staff. He was introduced to people at Mathews and it was only a matter of time before they offered him a spot on their Factory Team. In addition to his competitive schedule Corey continues to head up the hunting club, Buck Wild Hunt’N Club, which was started by his dad. He has a passion for bow hunting and holds four Pope and Young records. At 35, he’s married, has six kids, and has worked at ATT for seventeen years. 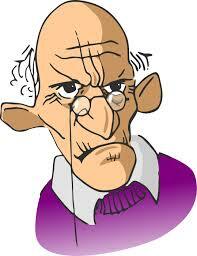 Obviously, a busy man, Corey’s pleasant nature and calm disposition are marks of his maturity. In him his family and archery have a true champion. There was a movie, “Secondhand Lions” that came out in 2004. The movie was about coming of age and two aging brothers that enjoyed adventurous lives. 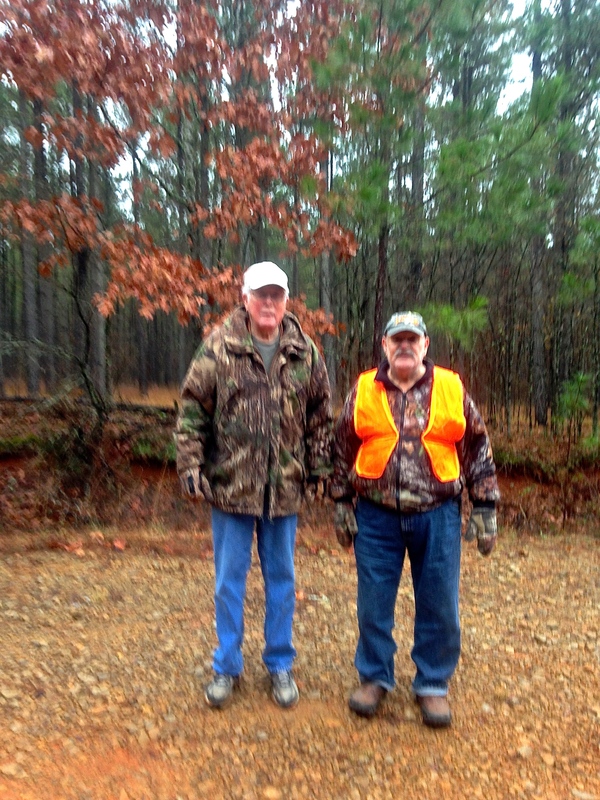 Hunting, this week, I’d been spending a lot of time with two “old” friends. By old I mean chronologically. These two characters, Ray and Guy, 86 and 75, respectively, are both still going strong, still having adventures, and neither acts his age. Ray and Guy met in 1968 bowling in Savannah, GA. Both had finished their active duty military careers and were beginning a new phase of life, after retiring from the Army. Ray had served in the Korean War and had been stationed from Panama, the Presidio, to El Paso, and other bases. 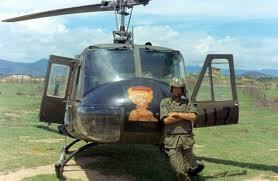 Guy had been a Drill Sargent at Ft. Knox before becoming a pilot and serving in Vietnam. In 1968, Guy needed a fourth for a bowling team and Ray answered Guy’s ad. From that point forward these characters have been fishing and hunting partners of unequaled ranging and outdoor skill. 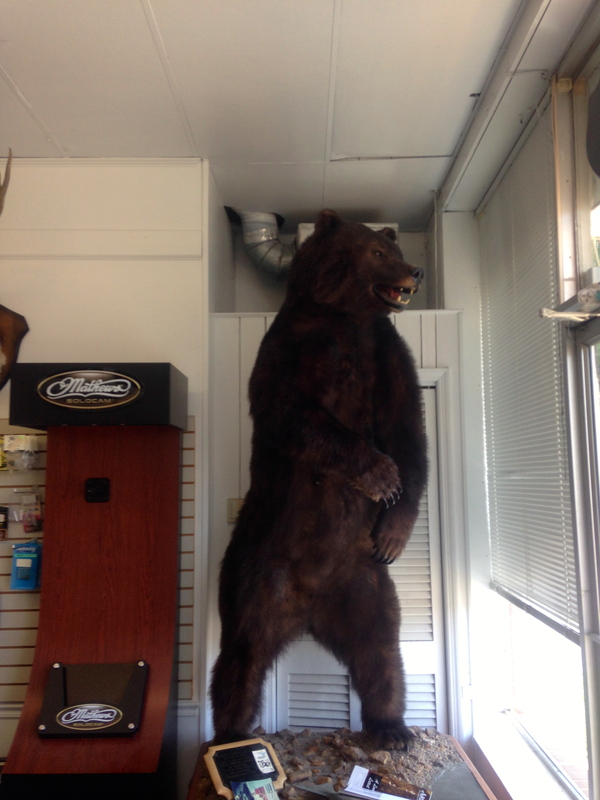 They’ve hunted brown bear in Alaska (Kodiak Island) and fished the Amazon River. After active duty Ray taught ROTC for 20 years and Guy became a helicopter pilot instructor. 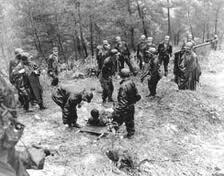 During active duty Ray spent time MIA behind enemy lines in Korea where he worked to return to his unit. Guy participated in the Tet Offensive and over the course of his military flying was shot at and shot down. Today, they spend time shooting “at” animals. Both have been archers using recurves to early compound bows such as the Browning X-Cellerator. Both still have their X-Cellerator. Now, they use crossbows as their primary bow. 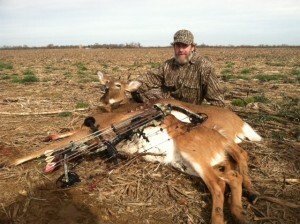 A few weeks ago Ray used his cross bow to take a deer. Sitting around listening to them talk is a real treat for a younger fellow. Their stories and experiences are among the greatest adventures a man could hope to have. Each has a rich and wonderful family with children, grandchildren and great grandchildren. Ray a native Georgian and Guy from the Bronx make for an unlikely friendship, yet nearly four decades since they met they still find ways to live large. Traveling around the east coast of the US to compete and hunt I cross paths with many interesting people. In Madison, GA I met another one of these good folk, “Big John” Chandler. 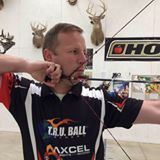 John is a level 3 USA Archery certified coach. I met him during a tournament. 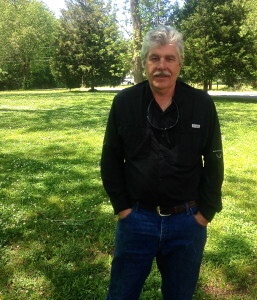 John is originally from Milledgeville, GA and now lives in Eatonton, GA. There he is the Archery Tech at Lake Oconee Golf and Archery. He also runs the Georgia Archery website. John has been an archer for 27 years. 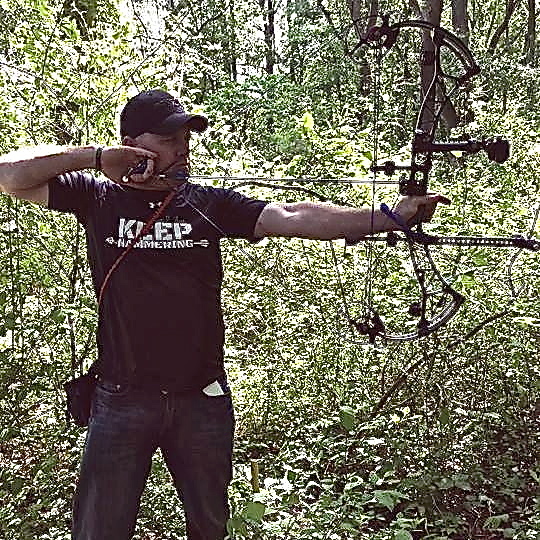 He purchased his first bow with ‘birthday money’ when he was 15, a PSE Nova. 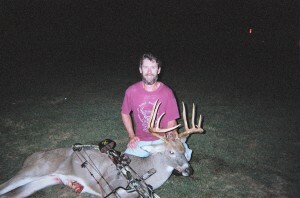 He’s been a member of the PSE and Hoyt Staffs, with his primary affiliation with PSE. His dream was to become a professional 3D archer. During his quest to climb the 3D ranks he was a regular ASA Top finisher and earned the Shooter of the Year for Georgia. 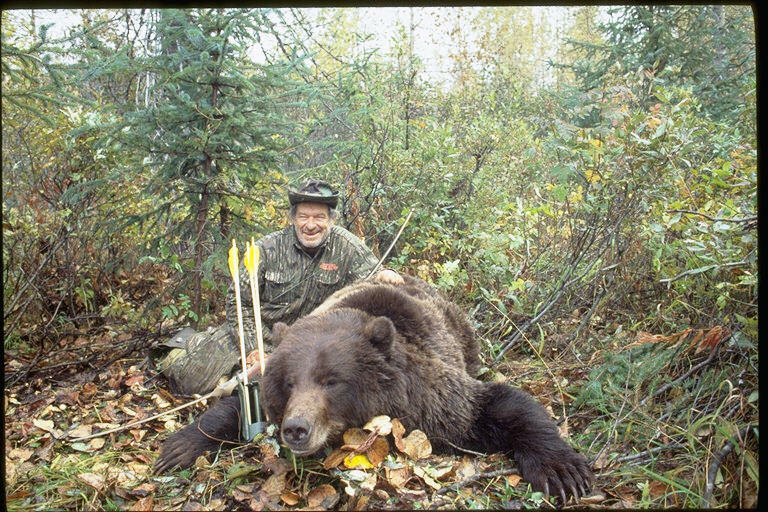 He also won the ‘Bear Archery Jamboree’. However, in 2003 and 2004 he began helping kids shoot. That’s when he found his passion for coaching. Today, he coaches 12 – 15 youngsters and adult archers. He also assists with the local 4H Archery Team. At the recent tournament where we met all of his students that competed earned a medal. John earned second place in the adult men’s division on top of his coaching efforts. While we talked at his shop he showed me around the facility. 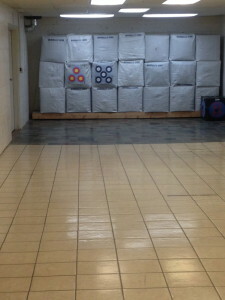 They have a nice indoor range where John gave me a short demonstration of his back tension release. 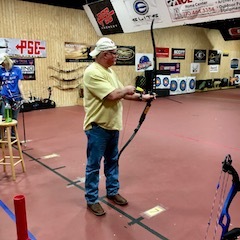 John picked up his bow, having not touched it all day, and fired off three shots, all in the X.
He’d been working on his 2015 archery schedule when I arrived. He let me know there is another tournament in Evan County, GA in January. It overlaps Lancaster, which I’ve been considering. As I pointed out, “January – Lancaster, Pennsylvania, cold and snow, Evans County, GA, warm” it will be an interesting choice. One of the many nice things about being a full time archer is travel and meeting other archers. All have interesting stories. John’s story impressed me because of the sincerity of his desire to help others. Watching him coach his students on the line in the recent tournament was an example of his devotion to the sport. I look forward to visiting him again on my next trip to Georgia. Paul Burrows is one of those guys that are always around to help. 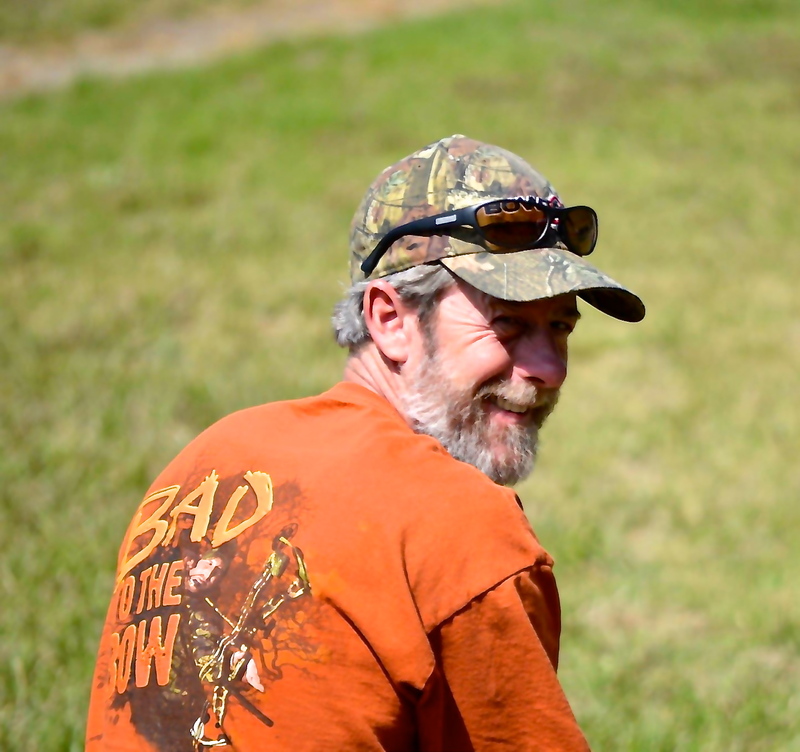 He’s an upper level archer and bowhunters, a testament to his 27 years of shooting. Twenty-four of those years he shot right handed, he switched to left handed three years ago because of eye dominance. Born in Chestertown, Maryland he is a true Eastern Shore native. 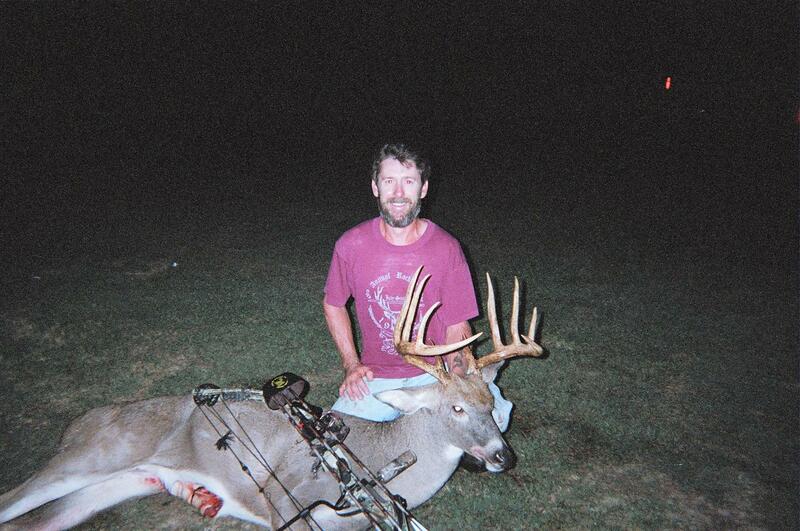 Paul’s late Uncle Wayne Moore taught him to shoot a bow when Paul was a young man. The lessons stuck and he has been shooting ever since. Today he helps others enter and learn the sport. 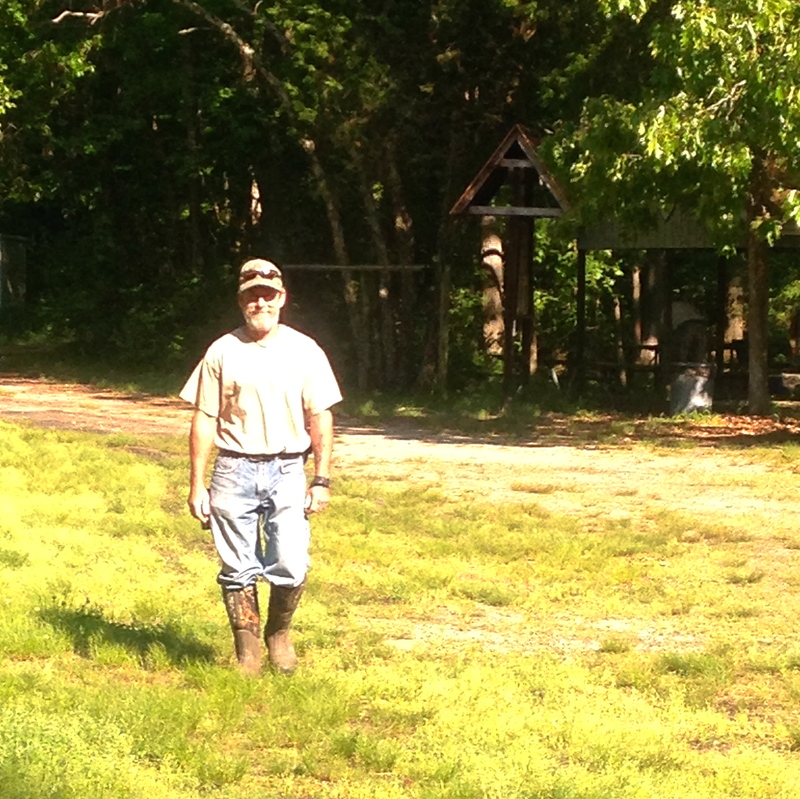 Paul says, “I work with kids at the DNR Junior Hunter Field days and a youth league at Cypress Creek Archery.” He is also one of 3 guys who helped start the Kent County ” Shore Shots “ 4-H Archery Program. A member of the Tuckahoe Bowmen Paul is always first on site for 3D shoots and one of the last to leave, setting up and removing targets. During the competitions he can be heard encouraging and supporting. 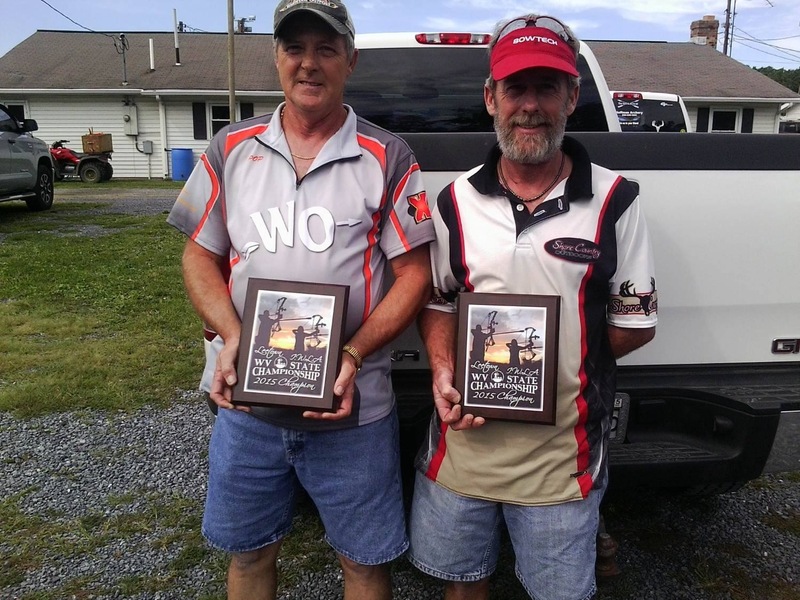 His skill as a 3D competitor has landed him at the IBO World Championships on three occasions and he is the 2015 IBO West Virginia State Champion in the Hunter Class. Which is not a surprise, he is a seasoned hunter. Recently, he sold a bow and commented, “That has been a good bow, I killed 74 deer with it.” Having grown up on a farm Paul is not shy about harvesting meat and is a Life Member of the Maryland Bowhunters Society. Married to Wendy they have two children, a son and a daughter. Paul works construction and is never too tired to be a father, husband and athlete who gives back to the sport. Traveling the east coast competing in archery has allowed me to meet many interesting people. One among them is Dave Gardner who lives near Kalamazoo, Michigan also near Scott and Vicksburg. Undoubtedly, Michigan is not on the east coast. I met Dave at the IBO World Championship in New York. Dave is a character. He is a man that does not meet a stranger. He has a quick smile, fast story, and fair sympathy for less than perfect shots. Dave is 54 and we were teamed for the two-day shoot in NY in the Senior Hunter Class. His youngest Andrew suffered a traumatic brain injury while snowboarding when in high school. He injury put him in a coma for 6 weeks. When Andrew awoke he commented the six-weeks coma felt like five minutes. He also awoke to left side paralysis. When Dave talks about his sons you can feel the pride in his voice. Shooting with people from around the country is great. So many have wonderful stories and adventures to share. Dave is among them and it has been a pleasure to get to know him. Looking forward to seeing him next year at the IBO Worlds in NY. For archery enthusiasts, it is a sport and for some, a way of life. As such, the interactions between competitors, sportsmen and sportswomen tend to be more than who won an event or who brought down the biggest trophy. Athletes like to share and hear each other’s stories: challenges, victories and failures. That is, most archers. One group of characters from the western shore of Maryland took particular offense to me. I’d posted an account about the 4th of July. The 4th is an American celebration and it is a big deal in our family of veterans from the Army, Navy, Coast Guard, Air Force and Marines. My family has two West Point graduates and several former NCOs. 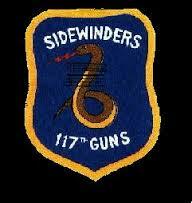 They’ve worked in the Pentagon, fought in wars (one still is fighting), and were paratroopers and Rangers. We are proud to be American and we are passionate about celebrating and recognizing our freedom every year on the 4th of July. I’ve received numerous comments from the 1047 people regarding the 4th of July post. There were pleasant remarks from Japan, Israel, India, Russia, Germany, England, China and Iran supporting our celebration of the 4th. The real surprise came when I shared the article with a small group of archers from Maryland. Since sharing the article with them, I have been banned from the group. 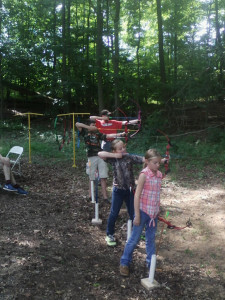 They claimed I had no connection with archery in their state, and that I only wanted to promote my website. Here’s the rub: I lived in their state for 15 years. 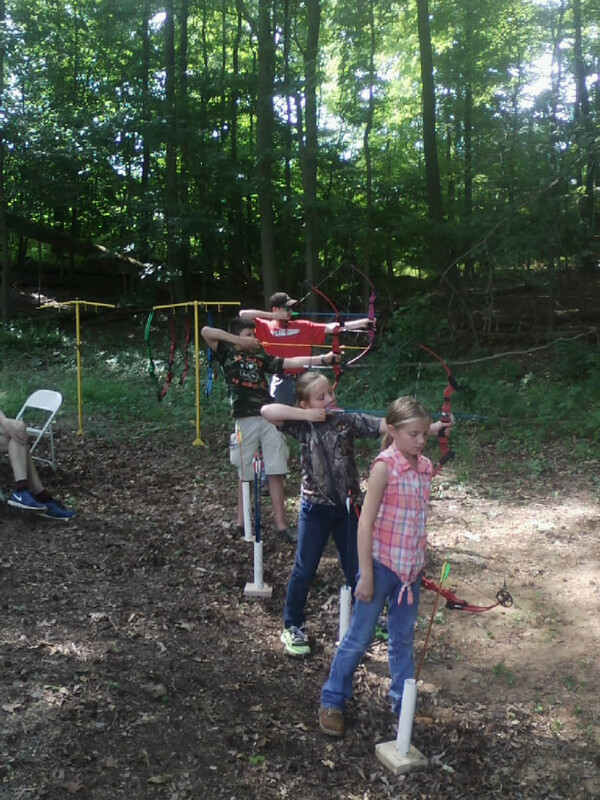 I am a member of the state’s archery association, and two of the state’s archery clubs. 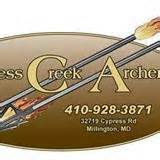 I write about archery in Maryland. 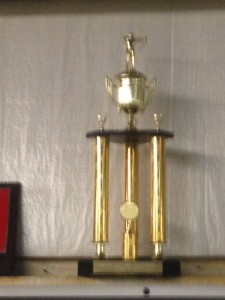 During the past seven months have competed in 14 tournaments in the state. Regarding their second claim, of course I want to promote my website! The whole point of the site is to host a space where archers from around the world can share the experiences of archery, fitness, family and adventures. Most people understand these values regardless of their hobbies, passions, jobs or nationality. The latter was evident from the likes and comments of America’s 4th celebration, my commentary on it, and the citizens of eight countries beyond the US that took time to notice my work. I explained this situation to a friend of mine, a ‘non-archer’ as she likes to call herself. 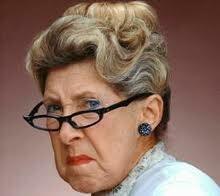 She stopped me in the middle of my diatribe and said, ‘I have a vision of what this group looks like. “I picture a bunch of grumpy old men sitting in worn-out leather chairs, smoking cigars in a stuffy old club with dark green walls that are in desperate need of a fresh coat of paint, an array of dusty animal heads on the wall that have chunks of dead flesh and fur dropping onto the floor at the slightest breeze, regaling each other with stories of years past when they shot a buck from around the corner while standing on one foot, in the snow, with no shoes, during a hurricane, and looking backwards into a mirror. Riiiiiight. That’s why they don’t like it…they have nothing to share.” I have no idea if her vision is correct, but it did make me wonder and more importantly her perspective made me laugh. Thankfully, since I began this chronicle a few months ago, I have nearly 400,000 hits and over 21,000 people that have read over 45,000 pages of the articles I have written, without complaint – excepting the one group of characters in Maryland. A great many thanks goes out to my fellow archers, athletes and friends from around the world for enjoying and participating, including my many connections in Maryland, minus that one particular pissed-off group. 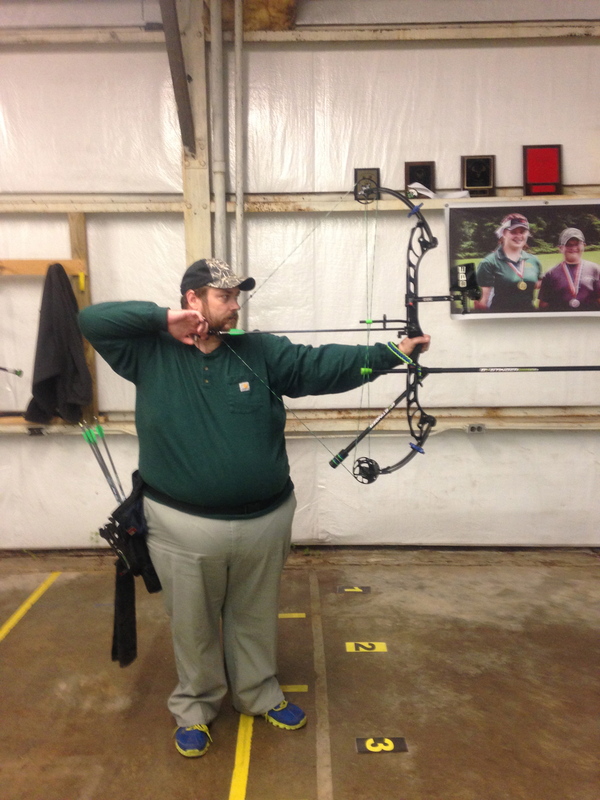 Lee Wehr and his wife Julie are devoted archers. They’ve been involved with the sport for the past eight years. How they become involved is quite a story. 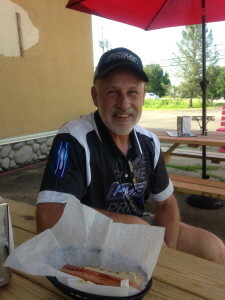 Lee is a former Landscape Foremen in Milwaukee, WI. During his work he was involved in an accident leaving three of this vertebra seriously damaged and requiring surgery. 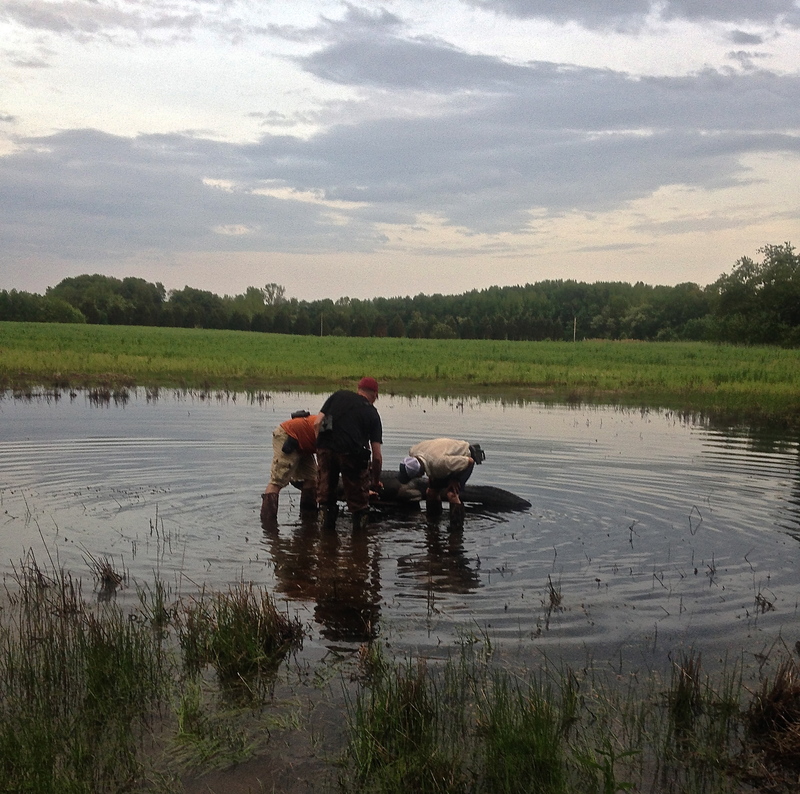 The operation removed pieces of crushed backbone and left him somewhat incapacitated. Before starting archery, he new nothing about the sport. He asked his wife Julie to join him. He said to her, “I am going to look like a fool, come with me and let’s look foolish together.” She agreed, that was eight years ago. Lee said, “In Wisconsin we have the Packers and whitetail deer, both of them run at the same time, and we have Mathews Bows.” Lee and Julie, neither of them ‘Pro-Staffers’ have Mathews equipment and can’t say enough good about the support they’ve received from the company. “When we call, they stay on the phone and help. We always get what we need, “ he commented about the Wisconsin based company. 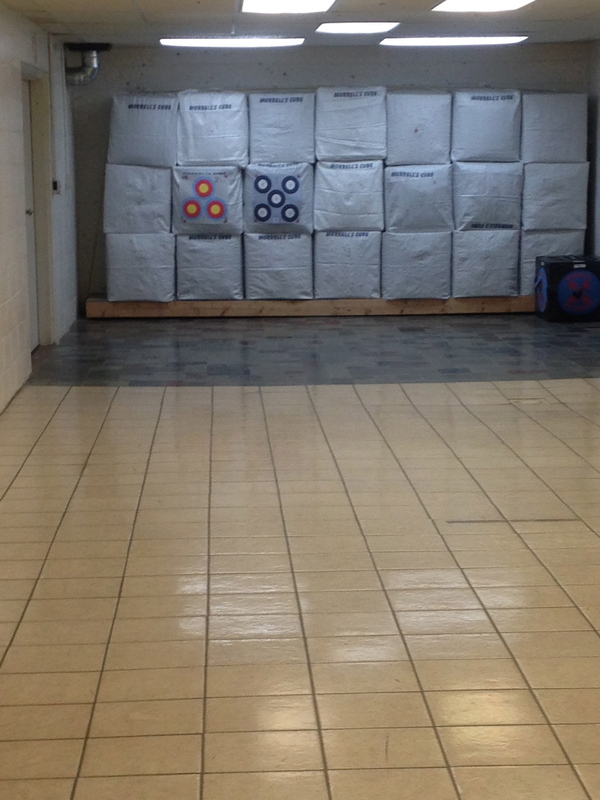 Shooting outside is tough in the Wisconsin winters so they turn to indoor league competition. “The leagues in Milwaukee run 9 to 12 weeks. “ said Lee. Despite Lee’s injury, he and Julie have found a common interest to keep them active. It took a little convincing to get this interview from Lee. “There are a lot of better archers and experts than me,” he told me. I’ve found that there is almost always someone better in sports, but not everyone grasps its non-competitive benefits. Lee and Julie understand, at the end of the day, life is not simply about who gets the highest score. Norman Gustafson – Auctioneer, Archer and Master of Soggy Bottom. I’d just completed my second Ironman event of that summer and yes, indeed, my legs were shaved. But feeling discretion was the better part of valor, I deemed it best to keep quiet and see what was in fact going on. Soon it was obvious the comments were aimed at Norman Gustafson. Norman couldn’t have cared less; the jests didn’t faze him. He nocked an arrow, drew his bow, aimed, and pin-wheeled a foam deer. That was nearly a year ago. Since then, I have learned Norman legs aren’t shaved but they were when he was a serious cyclist, hence the jibe. Today, the bow has replaced the bike, but the seriousness remains. Archery, too, is in his blood. 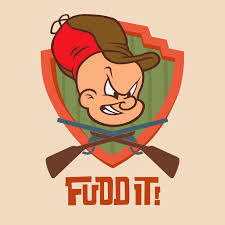 He has been a competitive shooter since the 90’s. He shot with a group on the Eastern Shore for six years non-stop. The group disbanded and Norman was on his own. The solitude led to a brief pause in competition until he met Paul Burrows another local archer about seven years ago. Since that meeting Norman has continued to shoot and improve. His recent podium finishes include 2nd place at the West Virginia State 3D Championship and 3rd places in the Delaware and Maryland State 3D Championships. He has also competed at the IBO World Championships four times. Following an IBO World Championship, the IBO sales the targets used during the tournament at a discount. A few years back, Norman purchased three of them to place in his yard. 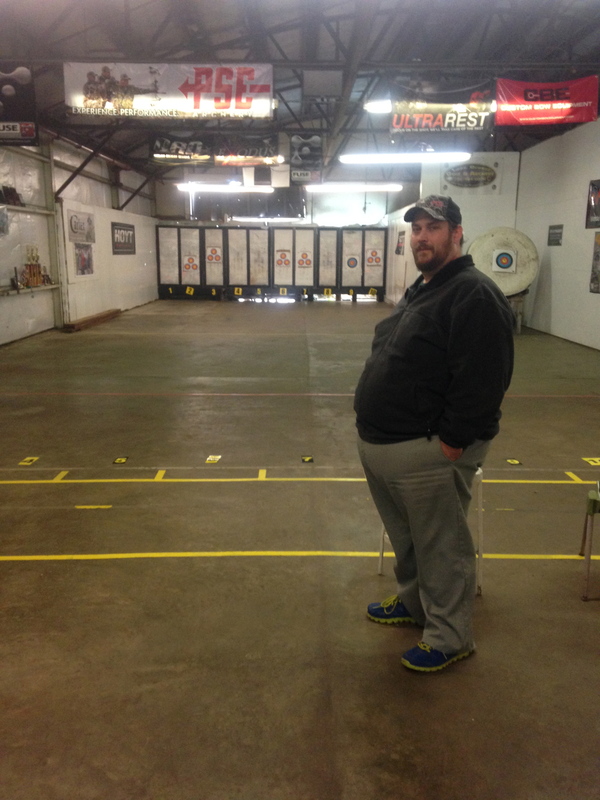 After the next year’s IBO World Championship he added a few more targets to his collection. Several targets were gathered through auctions. Norman said, “Most people don’t know what they are,” in reference to the foam animals. These first few targets led to a stable of over 20. 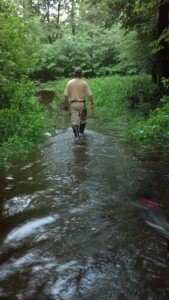 Today, his foam animals are hidden among the densely forested and swampy “Soggy Bottom” range. Each week, from his standing invitation, a group of shooters meet to pit themselves against an ever-changing and challenging course. Soggy Bottom is on a portion of land adjacent to Norman’s home. His directions to the range are, “When you come up the lane look for the 2nd telephone pole on your left, in the field. You’ll see an orange flagging tied to a tree on your left. Turn left there, go across the field, past the pond and follow that road all the way to the woods.” The consensus of his friends is, “You can’t see a telephone pole and you don’t see the orange flag until after you have passed it.” First timers to the range will likely end up at his house begging for help from his wife. Stephanie, Norman’s wife, is headed to anesthetist school in Nashville. Norman, with their son and daughter will be leaving us while Stephanie works to fulfill a dream. We are going to miss them in Maryland. But, it is great to be able to achieve a dream and we wish Norman and Stephanie the best in all endeavors. We’ll catch up with Norman at the IBO World Championship where we’ll remember his shaved legs to anyone within listening range. Brenda, my wife, and I want another home closer to family in Georgia, and a place to get away from the cold winters of Maryland. Looking at houses isn’t number one of my list of fun activities. We needed another viewing of a house we’d found in Washington, GA. That meant an appointment with the realtor to see the house and she, Deborah, brought her husband along on this trip. 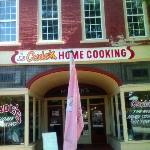 We were early for our appointment so we paused to have lunch at Cade’s Home Cooking, at 9 East Square, in Washington. Cade’s is a Southern home-style buffet and if you are ever in the area it’s worth a trip. The food was wonderful. After eating, to kill time, we bought groceries (I napped in the truck while Brenda gathered the provisions. I’d hurt myself at Cade’s) then drove to our appointment. We’d already seen the property twice and I’d ruled it out. Brenda was still on the fence. The house was great, the local not so great, and the price too high. Already reaching that conclusion, I was bored with the process. Deborah’s husband, Ken, was polite but seemed a bit bored as well. He and I moseyed out back where he began talking about the turkey he’d not shot this season. In that, we’d found common ground. 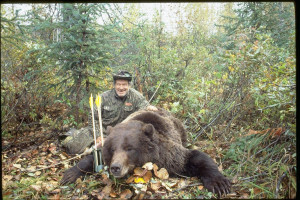 Ken is an expert hunter and as the conservation expanded I learned he’d hunted all over the world. Next, I learned he hunts with a bow. Ken is a serious archer. He’d been on the archery team at the University of Florida when he was a student; his major was forestry. His and Deborah’s home has some acreage around it and he’s set up a 3D arrangement to practice. He said he often shoots from his balcony into four nearby targets on his makeshift range. Among his stories, he regaled me with a tale of a recent “Robin Hood” he’d shot using a broad head from his home perch. We talked until about archery until Brenda urged me, “The ice cream is melting! Let’s go!” I was sorry to leave, enthralled by Ken’s recounting of bow hunting in Africa was fascinating. I never know when or where I am going to meet another archer. Meeting Ken turned a monotonous appointment into a pleasurable encounter. We decided not to buy the house. We’re still looking for a home in Georgia. On my list of requirements are places to run, ride, and swim and of course, shoot. 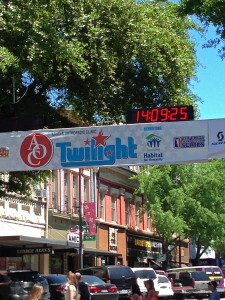 Athens, Georgia is the home to the University of Georgia, the Twilight Criterium, my oldest daughter, her husband and son, and Archery Traditions. 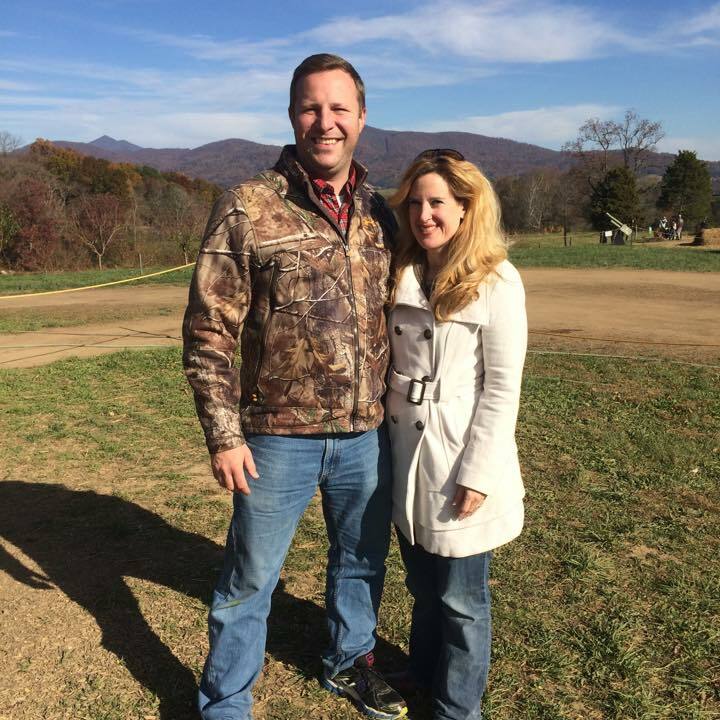 During our Turkey Trotting (hunt for wild turkey) through Tignall we made a quick trip over to Athens to visit all of them. Our family is filled with a rich supply of UGA graduates and other universities in the Georgia system, including Georgia Tech, Georgia Southern, and Kennesaw State. 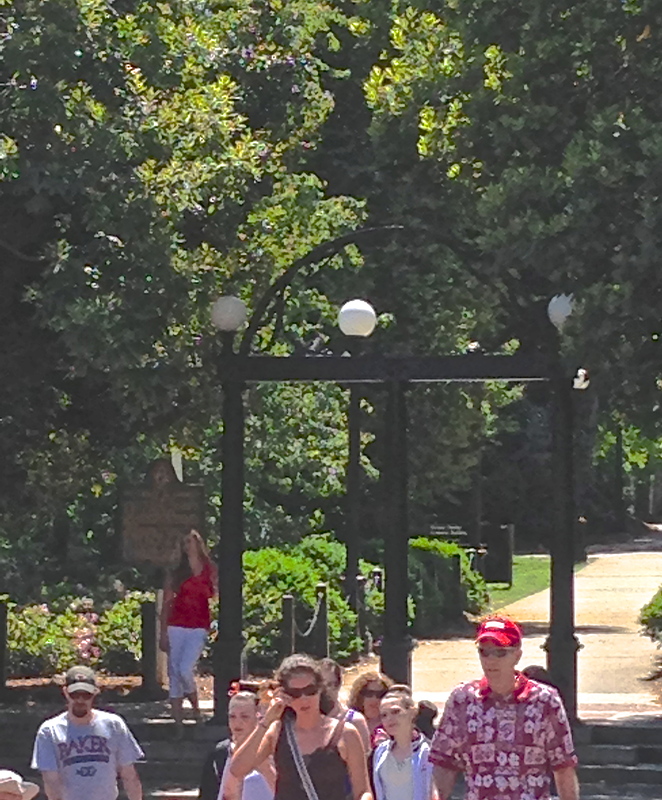 Native Georgians, it is always great to come home and visit UGA. A less fortunate, not an Alumni of UGA, I am still a “Dawg” at heart. On this weekend, Brenda, my wife, and I stayed with our oldest daughter and her family for a couple of nights before headed back to Tignall. She and her husband, Bill, are UGA grads and met while in school there 12 years ago. 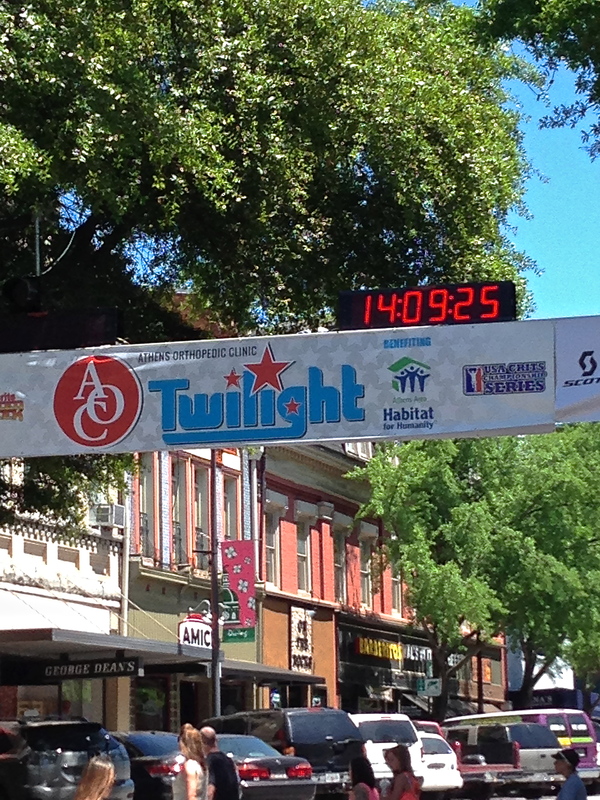 Athens is a hub of activity and this past weekend was the racing of the Twilight Criterium. When we arrived entering the race was hard to resist. I’d brought a bike, my Litespeed, with me. 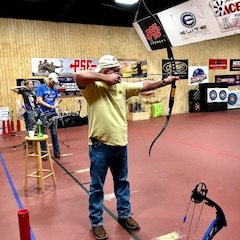 On second thought, I pushed the desire to compete out of my head and soon we drove to Archery Traditions, one of my principle reasons to be in Athens. 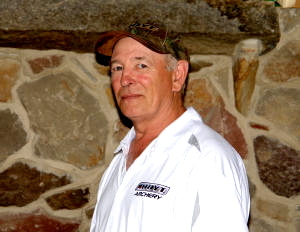 Dan Quillian founded Archery Traditions, somewhat of a Southern Archery Mecca, in 1996. 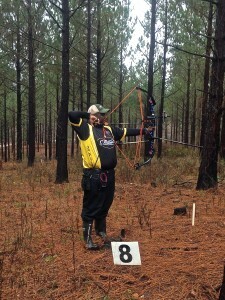 Dan is a legend in archery and local from Watkinsville, GA. Sadly, Dan passed away in 2007, but his internationally know pro-shop is still in business. 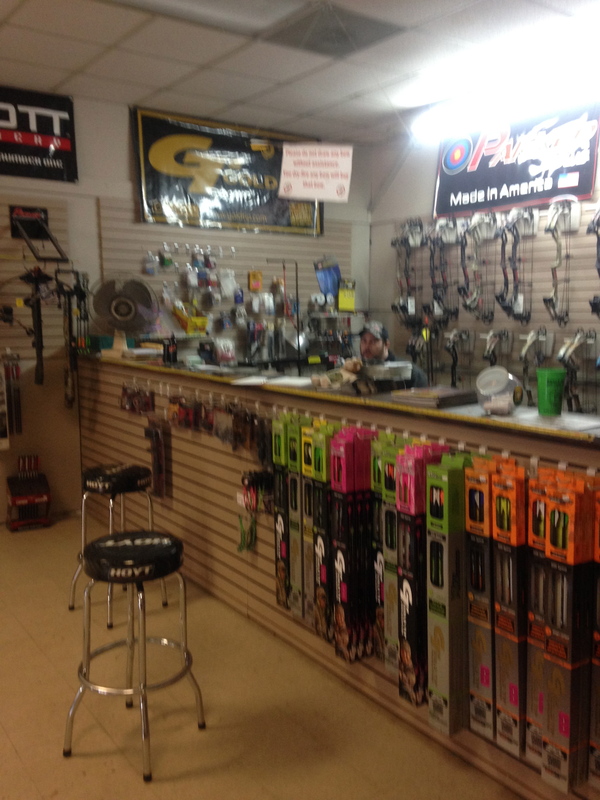 Today, they carry Mathews and Hoyt bows along with a number of recurve products. Athens is always an exciting experience. Our family, the sports activities, and characters we meet when we return all convey Southern Charm. Even though Dan is no longer with us, his presence could be felt in Archery Traditions that displayed many of his trophies. Some of the characters in archery have left us, Dan among them. What he left behind in legend and spirit remains. When Harry Gosser talks about archery he speaks with enthusiasm and knowledge. 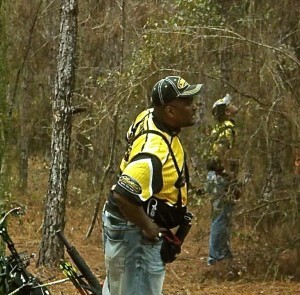 Archery is a major part of his life and he is never at a loss to share his thoughts on the sport. In other matters, he is often bit more reserved. Harry is one of those smilingly, quiet, non-opposing fellows that expresses archery authority, and rightly so, he has been occupied with shooting for over 40 years. 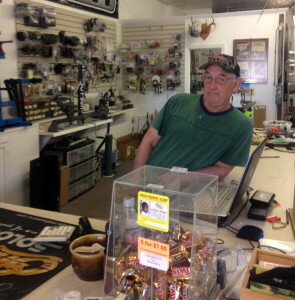 Harry is a familiar and hospitable icon at Cypress Creek Archery in Millington, MD. 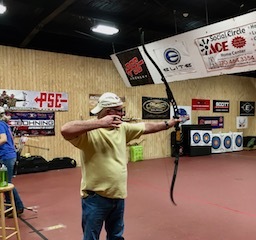 He is instrumental in managing and promoting the Cypress Creek Indoor Archery League competition. But, that is not how we met. We met while I was searching for an indoor range to prepare for a tournament in Florida. Cypress Creek was an Internet discovery and not too distance of a drive for regular practice. 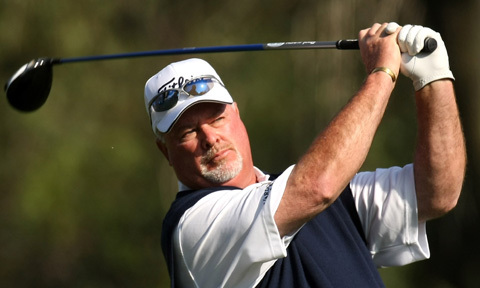 In preparation for the tournament I shot at Cypress Creek nearly every day for months. Along the way, Harry became my friend. Harry is a certified instructor and has given me many pointers. He’s bow hunted most of his life and while in the Army began competing in archery, a pastime he carried into civilian life. Harry says, “I tried to make myself into a machine so that every shot was the same.” He adds, “It is important to make that first shot.” His podium finishes add credence to his approach. During his career in archery he’s also become an expert bow tuner and bowstring maker. Those of us that shoot at Cypress Creek look forward to seeing him when we go there to shoot or make a purchase. He is a local symbol of archery. Whenever he talks, he typically shares a pearl of wisdom enriching the experience. One item he does avoid is a computer. He knows how to “mess” with computers and the Internet but choses to get involved with them as little as possible. Someone (probably me) will need to print this so that he will be able to read it. Reviewing this with him over the phone, “Ya, you got it right, that’s real nice” was his only comment. Typical Harry. Archery has a myriad of personalities. When archers gather, we talk about some of the persona of our sport. In most regions excepting for the professional archers winning big money, there are frequent names that float about during conversation. On the Eastern Shore of Maryland a commonly floated name is Bart Shortall. I spent a few hours interviewing Bart about his life and archery. “It took me five years but I made it, “ he explained. Until that would happen, Bart did odd jobs, worked in a plastics plant, and became a paramedic. In 1991 Bart achieved his career goal, he was hired as a paid firefighter in Anne Arundel County. He worked in his chosen field until he retired in 2010 as a Firefighter 3/EMT. During those years, Bart found a passion for archery. Bart is not a shy man and far from introverted. He makes friends quickly and has made countless in archery. 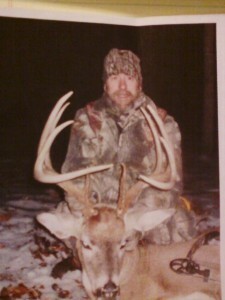 His entry into the sport was fueled by a desire to bow hunt. In 1989 his bow hunting adventures began with a PSE Challenger. Like many others archers of 1980’s using a compound bow, shooting the PSE was done minus a bow sight using fingers to draw the arrow. Now, Bart was well equipped to hunt deer. 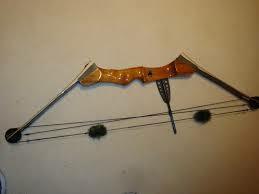 Simultaneously, beginning out of necessity and becoming a hobby, Bart began making bowstrings. Back then, he says, “… there was no way to pre-stretch the string. I began devising methods to stretch them. I would tie them to the beams in the garage. Then, tie a bucket to the other end and fill it with rocks and water.” Bart’s hobby strings were so well crafted other archers began to request them. His hobby evolved into XFire Stings where he is the sole proprietor and master craftsman. Highly sought after, XFire stings are used by professional archers as well as avid hunters. And although his strings were taking off, his focus remained archery competition. 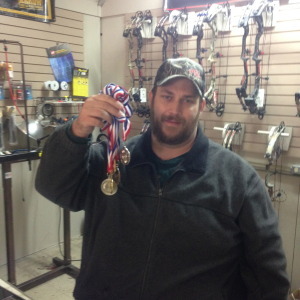 Bart’s archery resume is impressive with such accolades as: Delaware ASA 3D Champions (Twice), Maryland Archery Association 3D Champion, West Virginia IBO Champion, 3rd Place IBO Indoor National Championship, 6th Place 1st Leg IBO Triple Crown, and 7th Place IBO World Championship. 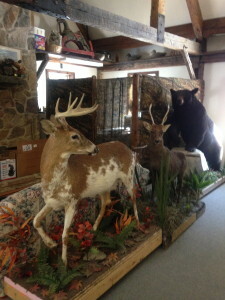 Bart began writing about hunting, archery, and the outdoors. His first hand knowledge has been disseminated through over 45 published papers in a variety of periodicals. Beyond his experience as fireman and archer, what shines, is his friendliness and willingness to help others. These traits I expect drove him to become a firefighter and EMT in the first place. While interviewing him, at his home, the atmosphere was relaxed and easy. Angie, his wife briefly visited us. She was busy and heading to the grocery store. Angie is three years younger than Bart. She is youthful, quick to smile, and has great sense of humor. Before being introduced, I thought Angie might have been Megan his older daughter. I didn’t meet their oldest daughter. I did meet his youngest, Emily. An 11 year old, who after a few minutes of conversation wanted a lesson on how to set-up a website. Even Bart’s dog was friendly and ready with a lick and leaning dog hug. After this short interview, they sent me home with two packages of venison. The Shortall family’s openness and warmth was exemplified by the gifts. Bart is one of those gracious helpful individuals who circulate in the sport of archery. In Bart’s case, an archer, writer, outdoorsman, paramedic and firefighter, his life has been and continues to be about putting it on the line. 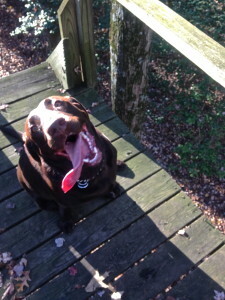 River, the deer stand climbing lab, a non-human character. My first character is, in fact, not human. My first character is a dog. You may have a good dog. You may feel certain your dog is the best dog. For you and your dog that is probably true. River is my dog; therefore, I think she is the best dog. I’ve had a few other good dogs. A few are standouts: Magic, a Great Dane and true gentleman, Hershey, a “fire safety” wiener dog, and Barrett #1, a cocker spaniel and fearless swimmer. Like most Labrador Retrievers River is a great swimmer. She has swum over a mile beside me in Little River. She is a runner having paced me through a half-marathon. Nothing is irretrievable for her with one frustrating exception: arrows. When practicing outside on paper targets River become enraged. She sits to my side. She watches the shot. However, the arrow is too fast for her to follow. Of course she hears it. 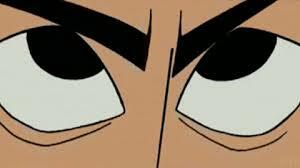 Her head snaps in the direction of the arrow and she becomes puzzled. She does not know where it has landed. She heard it hit the target. But, it was faster than a decoy or bird. To her this does not make sense and she gets irritated. Her barked obscenities are testament to her frustration. 3D targets are a bit more practical in her mind or so it seems. During practice she sits next to me at the stake. I shoot and she runs to the target. She hates, really hates coyote and wolf targets. When she reaches those targets she bristles and snarls. Deer, turkey, bear, and lion targets are another puzzle. After a shot, she will run to within a few yards them stop and “point” as if to indicate – that is not real. Why are you wasting time? Let’s go to the real animals. Deer stands are ‘dog podiums’ that no matter how stern or insistent my command for River to “stay”, as I prepare a shot, she will climb the stand, apparently, to laugh at me (see photo). As soon as I lift my bow, the deer stand begins to shake – I know she is coming up. It is a bit scary. Not for me personally, but I’m concerned that River is going to fall. I’ve learned there is no keeping her out of tree stands. Some stands she climbs before I reach them. She runs ahead, climbs the stand, surveys the target, barks once at me (instruction of some sort) and climbs down. At the moment, she is letting me know this is enough typing and I need to prepare her dinner. She is quite a character. Glad you liked it Rik. A load of interesting people. I read through them, scrolling down one at a time, looking forward to a woman’s story, some lady who inspires. Regrettably, there at the end, the only female who gets any recognition is …. your dog. Have you never met any inspiring women in archery ?? Yes, Rachel, I have met many interesting women in archery and other sports. Thanks for asking and reading. 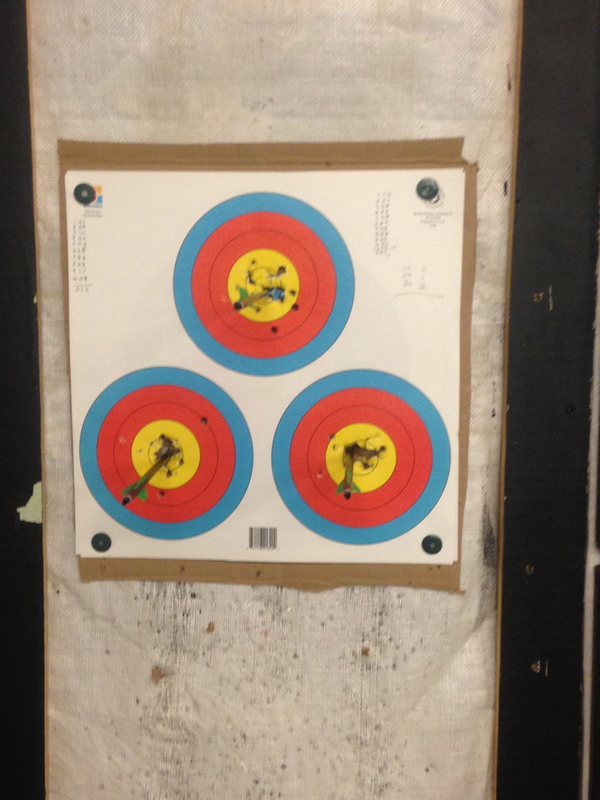 I have crossed paths with more men than women in archery. 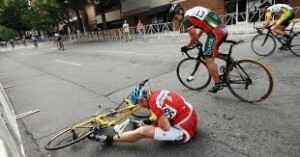 This is not the case in triathlon or running. In fact, in many running events the women outnumber the men. And, while River does get a lot of attention she is certainly not the only female that has appeared on my website. Your comment sent me back to my website to take a look for myself. I try to write for the website everyday and couldn’t remember titles of writings that had interesting and inspiring women in them. So, I mined the site for a few minutes. While the site is primarily about archery; it is not exclusively about archery. A number of the women written about here are involved in different sports. Those women that are inspirational in other sporting venues can provide insight that is useful to all athletes. As such, I have shared their thoughts that helped land them in the elite category. It is obvious there are no females in the “Archery Characters” section. It is not for trying. It is more a matter of me not yet being in a position where I been able to ask a female for an interview to be included in that section of the site. More plainly, I don’t know any of the top ladies well enough to ask. 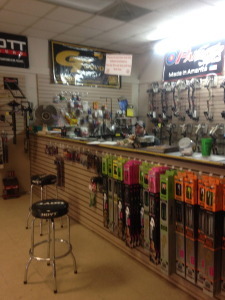 Corrine Bundy of Mathews, Inc.
http://puttingitontheline.com/archery-research/Archery and fitness: Vanessa is an ultra runner and shoots a bow. She is also an author, her book, Summit Seeker, is about ultra running, weight loss, healing and general fitness. http://puttingitontheline.com/archery-characters/Wisconsin Couple with a Passion for Archery: Julie Wehr and her husband Lee are devoted archers. Some might consider the strong female character, even though fictional, inspirational. Some about my wife, a professional athlete and ex-teacher that has inspired thousands. A bit about Maria and a photo. Not so much an inspiration article, but a fun day and Carlita’s humor still bring a smile. Rachel, perhaps you have an inspirational female archer among Great Britain’s team. I would be pleased to consider a guest that might write an article for the Archery Characters section of Putting it on the Line.